Uttarakhand Subordinate Service Selection Commission (Uttarakhand SSSC) invites applications for filling up the following 400 Vacancies of Jail Bandi Rakshak (Male) in the department of Prison (Karagar Vibhag) Uttarakhand. All eligible candidates may apply online for Jail Bandi Rakshak Bharti through the website sssc.uk.gov.in. 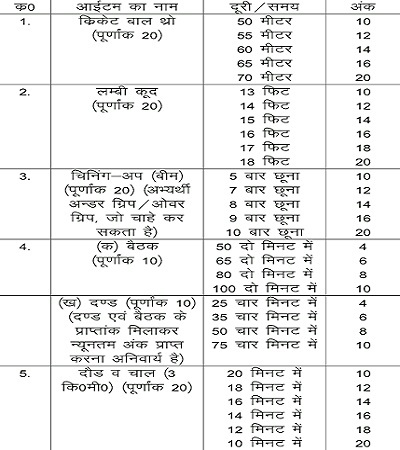 Latest information related to Uttarakhand SSSC Jail Bandi Rakshak Jobs or UK Prison Dept (Karagar Vibhag) Recruitment 2015-2016 as vacancy details, qualification, selection procedure, physical test, exam pattern, fee, application form, admit card, result etc. is given below. Latest update – UKSSSC Jail Bandi Rakshak Physical Measurement and Physical Test Results (Marks detail) are available online. Check the updated information below. Educational Qualification – Intermediate (12th) or equivalent examination pass from a Government recognised Board. Candidate should be registered in any of the Employment Offices of Uttarakhand State before last date of receipt of application form. Selection/ Recruitment process for the selection of UK Jail Bandi Rakshak will consist of Physical Standard Test, Physical Efficiency Test & Written Exam. For selection final merit list will be prepared in order of performance of candidates in the Written Exam & Physical Efficiency Test. Physical Efficiency Test will be of total 100 marks and minimum 50 marks will mandatory to obtain in aggregate with at least 50% marks in each item. See the image below for Physical Efficiency Test items (Cricket ball throw, long jump, pull ups, run/race etc) & marks distribution. Written Exam/ Written Exam Pattern– Qualified candidates of Physical Efficiency Test have to undergo an Objective type written exam of 100 marks. Question Paper for Bandi Rakshak (Prisoner Guard) Written Exam will comprise of questions based on General Studies (50 Marks) & Mathematical Aptitude (50 Marks). There will be negative marking of 0.25 marks for each wrong answer. Minimum 33% marks will be mandatory to qualify the written exam. Eligible and interested candidates may apply Online for Uttarakhand Jail Bandi Rakshak Recruitment 2015-16 through UK SSSC website www.sssc.uk.gov.in. Candidates should have a scanned image of their latest photograph (Max 50 kb) and signature (Max 20 kb) in JPG format, for uploading while submitting their online application. Candidates are required to read the advertisement carefully and follow all the instructions given for submitting online application. After submitting the application form online, take printout of the system generated application form for record or future correspondence. The printout of online application form or any other documents are not required to send to the Commission at this stage. For other details about Uttarakhand Jail Bandi Rakshak Recruitment, download advertisement notice from the link below. Search any information available on this site by the help of Google custom search box above. You may visit later for other latest updates related to Uttarakhand Prison Deptt jobs, Karagar Vibhag jobs, UK Jail Bandi Rakshak vacancy, Prisoner Guard, UK Bandi Rakshak recruitment exam etc.